Call 9885729292 / 9885347474 toBuy Dell Inspiron 14R and Dell 15R laptops in Hyderabad at unbeatable prices only available in our dell showroom in Hyderabad vadapalani .Dell Inspiron 15R is multimedia laptop with 15.6 inch high definition screen, dual core Intel processor and option for dedicated graphics @ affordable price.The Dell Inspiron 15R laptop's sleek new design is not only easy on the eyes, it seamlessly travels by your side without getting in your way. We are the authorized dealers of lenovo laptops in India. 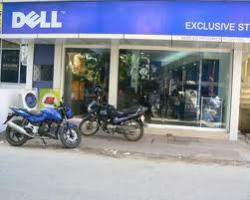 Ours is a ly managed company based in Chennai, dealing with the online sale of lenovo laptops. Lead by a team of enthusiastic people, our online venture is based on high levels of integrity and commitment. We see to it that our customers receive thefinest quality of lenovo laptops at the cheapest rate. Your one-stop point for all your office and personal requirements in IT, Telecom and HR Services.Customer satisfaction is our motto. At PRCC, we are committed to exceed our customer expectations and add value to the services they receive.